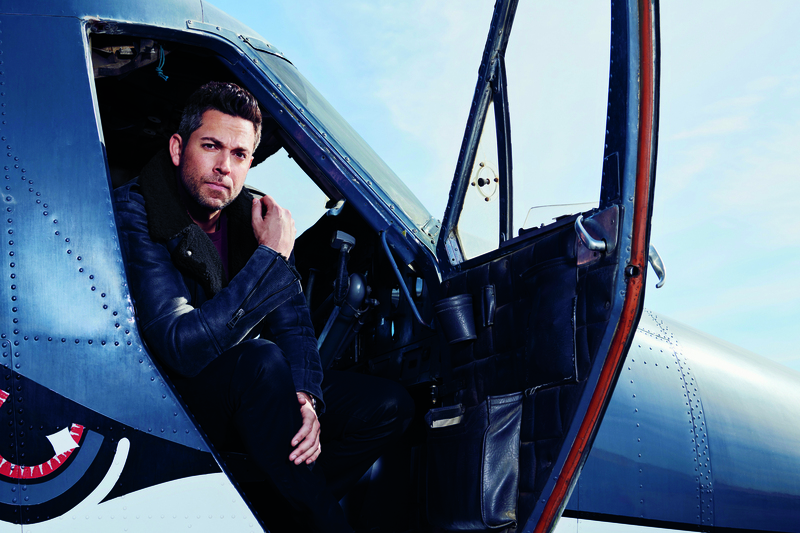 ZACHARY LEVI IS STANDING on the tarmac alongside a 1970s-era de Havilland DHC-6 that’s been painted to resemble a great white shark, its teeth bared and cartoonish. He’s changed out of the dark denim and button-down he showed up in, and squeezed his 6’4″ frame into a snug red flight suit—“like something Britney Spears would wear in a music video,” the actor quips. It’s a bright late-January morning at the Perris Valley Airport, a quiet airstrip about 90 miles east of Los Angeles, and the surrounding landscape is stunning—the San Jacinto mountains are parked to one side, the snowcapped San Bernardinos are chilling in the distance, and the sun is almost pink. With that, one of the instructors rolls up the plane’s door. Suddenly, it’s very windy inside. The instructor tells Levi to sit on his lap, and they strap themselves together for a tandem jump. Moving awkwardly, the two edge toward the open door. They double- and triple-check the ripcord. My ears pop. Levi turns to the photographer and cracks: “Let’s take some photos before I turn this red suit brown.” Then it’s as simple as 1-2-3 goooooooooooo! It’s now a few minutes later, and we’re safely back on Earth, seated at a table in the Bombshelter Bar & Grill, an après-jump watering hole with a pool table, framed aircraft memorabilia on the walls, and a menu packed with deep-fried foods. Levi’s pulse is slow and steady; he seems as though he’s just woken up from a nap, not parachuted from 12,000 feet to the ground with a photo crew documenting every second of the experience. 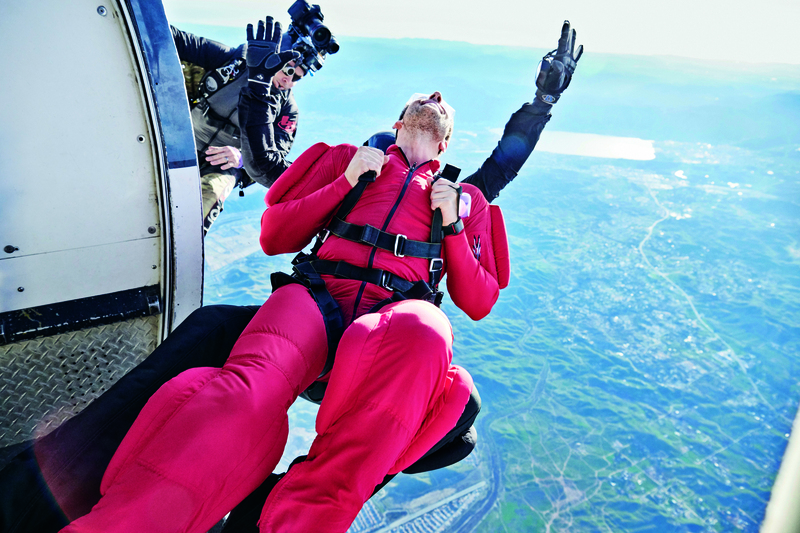 We’ll get to the lesson he gleaned from the leap—his fifth-ever tandem jump—but first: tequila. He asks for a double on the rocks with soda, the order rolling off his tongue. Levi is game and well prepared for all of the typical press-tour questions—eager, even. What did it feel like to put on the Shazam suit for the first time? (“I’m still registering it.”) What superpower would you like to have? (“Teleportation is number one.”) What’s it like to have your own action figure? (“I was a little kid playing with these things, and now I am one of these things.”) But this moment is particularly sweet because, by his own admission, he never thought it would happen. Throughout two decades in Hollywood, he always felt like “an outsider looking in,” he once said. He’s not fronting. His most notable project heretofore, the NBC comedy Chuck, about a computer whiz who becomes a superspy overnight, ran for five seasons and gave him serious nerd cred. But the show was always on the verge of cancellation; it finally was axed in 2012. He starred in a 2016 Broadway revival of She Loves Me and appeared in the second season of Amazon’s golden goose, The Marvelous Mrs. Maisel—playing a handsome if elusive bachelor—but he’s always been stuck at a specific level of fame. The kind that gets you invited to play in the NBA Celebrity All-Star Game alongside Justin Bieber. But not an offer to carry a major action-hero franchise. Until now. Levi in ‘Shazam!’ with co-star Jack Dylan Grazer. Steve Wilkie © 2018 Warner Bros. Entertainment Inc.
Shazam! is a comic book flick about a troubled foster child who is granted the wisdom of Solomon, the strength of Hercules, the stamina of Atlas, the power of Zeus, and so on. 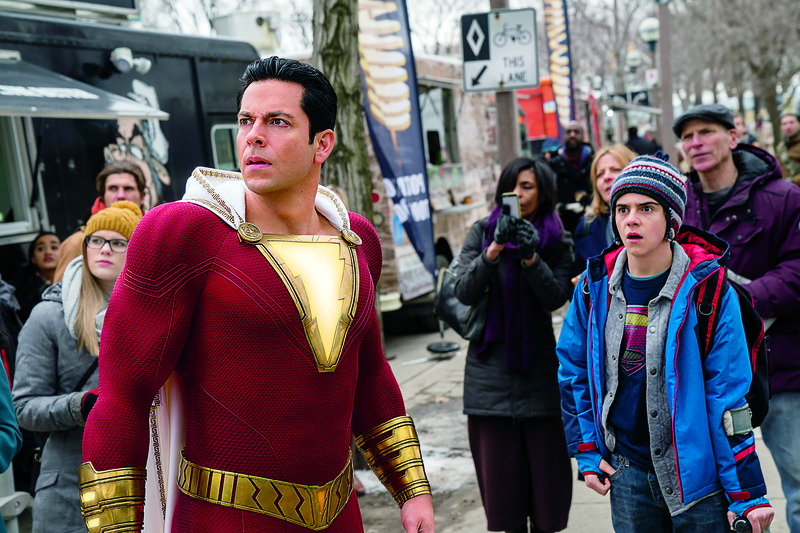 The movie has been described as Big meets Superman, and the comparison is spot-on: Whenever 14-year-old Billy Batson says “Shazam!” he turns into a 6’4″ superhero who can shoot lightning bolts out of his fingers. This is Levi’s biggest role to date and a massive bet for DC, which hopes to build off the momentum of Aquaman and Wonder Woman (and make us forget that dour Superman reboot and Ben Affleck’s ho-hum Batman). JUMPING OUT OF A PLANE, IT MAKES YOU REALIZE HOW SMALL YOU ARE. WE’RE ALL SO TEENY AND SO CLOSE AND SO CONNECTED. Comic book heroes often begin their journeys as orphans or misfits cast off by society. When Shazam! opens, Billy is about to move in with yet another family, the well-meaning Vazquezes and their five foster children. Levi’s own backstory—call it his origin story—is nearly as cinematic. Normally we’d ease into the personal, probing questions, but he’s raring to go, even before the first tequila appears. “My publicist is going to be…” he says, finishing the sentence with a laugh. He found his identity in the arts, performing in community theater productions as a child before graduating from high school and moving to L.A. to break into the business. There were TV pilots and a starring role in Disney’s animated Tangled. He performed at the Oscars with Mandy Moore in 2011 and played Fandral, a swashbuckling friend of Thor in the massive 2013 Marvel franchise. He was nearly cast as Star-Lord in Guardians of the Galaxy but lost out to Chris Pratt in the final moments. The rejection stung, a situation worsened when Pratt’s mug grew ubiquitous on billboards and magazine covers. “It’s part of what drove me into darkness,” Levi says. “My unhealthy take on what that meant to my own worth.” He had struggled with bouts of depression and self-doubt in the past, but this was something new, and newly frightening. At night, he’d struggle to sleep, unsure of what it all added up to. It didn’t help that in 2016, when he flew to Australia to film Thor: Rag­narok, he had just a few lines in the film—and they were cut. He appears onscreen only long enough for Cate Blanchett to casually impale him with a couple of flying swords. He learned that he needed to reprogram his own brain. One of the therapists told him, “You wouldn’t talk to your friends the way you talk to yourself. So knock it off.” “One of the things I learned was how to forgive my mom,” Levi says. “To look at her as the 5-year-old girl who was getting abused by her mom. This is generational. My mom thought she was doing the best things for us when we were kids. We’re all trying to do our best.” These days, he also has regular contact with his biological father. Newly hopeful, he filmed his audition for Shazam! in Connecticut on his iPhone and e-mailed it in. His agent called that same night. The director, he said, had watched the tape and freaked out. Levi’s young-at-heart energy was exactly what he’d been looking for. A week later, the studio signed off and Levi was in a costume fitting for the custom suit. To get lean, Levi was put on a strict diet of 3,000 to 4,000 calories daily—35 percent protein, 55 percent fat, and 10 percent carbs, with a tablespoon of fish oil for dessert. Soon enough, he filled out the costume. But Levi is not just playing at being a big kid—he’s very much one offscreen as well. He’s got a custom Harley-Davidson Dyna Super Glide, and a Ducati Monster, plus four gas-powered Jet Surf boards. He speaks fluent Xbox and carries a small Bluetooth speaker everywhere he goes. The man-child thing isn’t an act. In 2017, Levi sold his Studio City home (with hot tub and fire pit) for $1.4 million and bought a 75-acre cattle ranch outside Austin, Texas. The decision was simple. He hadn’t actually worked much in Los Angeles since Chuck ended. And a potentially crazy dream had taken hold. In Texas, he planned to build a compound, part film studio, part playground—in his words, “a really dope place to live and play” with zip lines and water slides, like “Warner Bros. meets Google Headquarters meets Disneyland.” He put all of his stuff in storage, and for the first three months, he lived in a Tommy Bahama Airstream parked on the property. He’s currently renovating the barn, turning it into a massive clubhouse. He’s also learning to surf—at an indoor wave park in Austin.